Thank you for considering The Dragon Hotel for your forthcoming business event. We are delighted to provide you with the details as to what we can offer here at the hotel. The hotel is a four star property located at the heart of Swansea’s vibrant city centre, and is easily accessible from all major routes and just a five minute walk from the train station. We have 106 en-suite bedrooms, a relaxed and informal Brasserie Restaurant, and a Health Club with an 18 metre pool and air conditioned gymnasium available for residents’ use. We have a variety of air conditioned meeting rooms with wireless internet access and an excellent range of equipment on site. 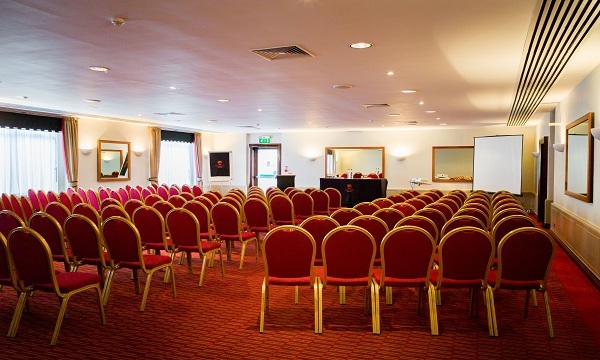 Our experienced and friendly events team offer the professional support you need to host an effective business meeting, conference, exhibition or corporate dinner for up to 180 people. If you have something specific in mind for your event, please speak with a member of the team who will be more than happy to tailor-make a package for you. For all meetings and conference enquiries and bookings, or to make an appointment to view our outstanding facilities, contact our meetings team today. E-mail conference@dragon-hotel.co.uk or ring 01792 657100 today.